If you are not using stock charts then you are essentially missing out on the simplest and easiest way to analyze the stock market. Even seasoned professional and old timers use stock charts to form an opinion and to enter and exit stocks. Stock charts are like what X-rays and MRI's are to doctors. They help us to determine the health of a stock. A picture is worth a thousand words. So let me show you how charts can help you be on the right side of the market. If you are very new to the stock market, the above is the daily Japanese Candlestick Chart of the S&P 500 futures. The price goes up and down and you would have no clue when you should be in the market and when you should be out of the market. Now let me show you something interesting. Notice how the simple red line can keep you on the right side of the market most of the time? No method is perfect but at least this RED line has been able to keep you away from buying stocks in a bad market. 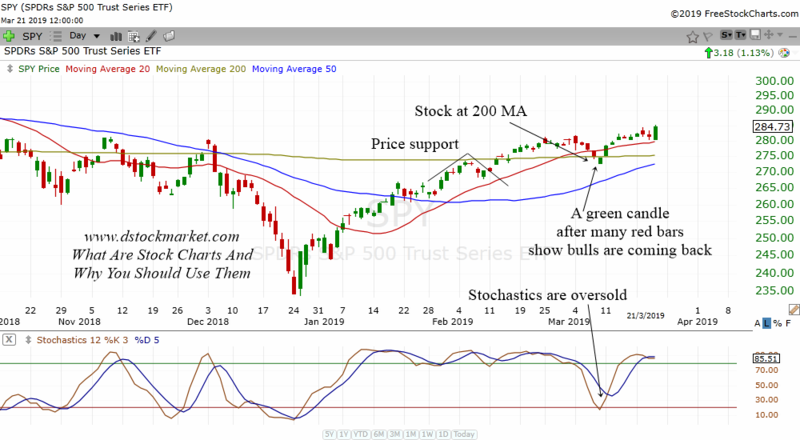 The red line is the 20 period moving average and sometimes traders or investor will put a moving average of the stock/index on the chart to help them know when to buy stocks or short stocks. Below is the daily chart of the S&P 500 SPDRs etf. Therefore our focus is to buy the dips or breakouts and not be afraid to hold stocks for the long term. How do the they know all the above? Through years of experience and analysis which you will also learn in the education which you can find on this site. In the chart above, you have price and volume and also 3 indicators which are the 20 day, 50 day and 200 day moving average. Using these 5 pieces of information, a seasoned investor or trader can dissect the market and know what is the appropriate action to take. If a report card tells the story of whether a student is doing well or not, a stock chart can tell us in an instant whether a company is healthy or not. The future is bright for the company. Which is why investors are willing to pay a high price for the stock. Take a look at the stock chart of Apple above. This tells us the story that Apple's future was bright in the eyes of investors at that time. If not it would not have gone up right? If a stock chart can tell us the story of a company doing very well, it can also tell us the story of whether a company is doing badly. CEO's can lie, accountants can cook the books, management can paint a glowing picture of the company. But there is one thing that even the best liar can't do. They can't make the stock of a bad company go up indefinitely. Sure they can make the stock price jump up for a quarter but in the long run, a company that is not doing well will have its stock price go down. Will you put your hard earned money into a company that is not doing well? Of course not. You want to put your money into the next Apple or Google or Facebook. 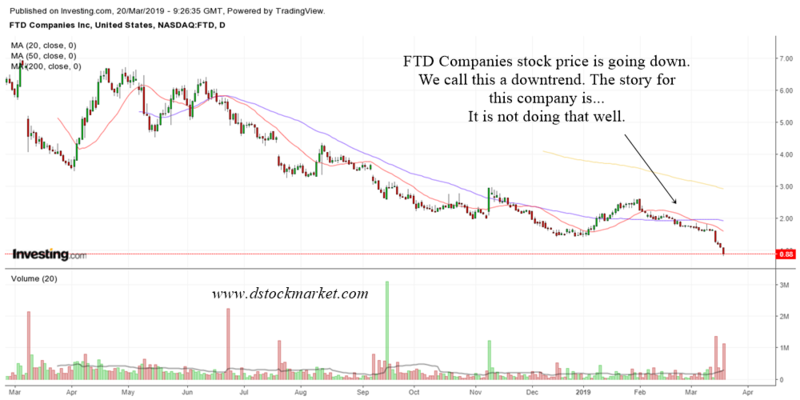 The chart above shows how FTD Companies' stock chart paint a gloomy picture for this company. Since the price of this stock is going down, we can say that this stock is in a downtrend. When a stock is in a downtrend, it means that it is not doing well at all. investors do not see a bright future for this stock. Which is why they are not putting money into the stock. When not many people are buying, the demand is low and prices will go down. What if I told you that stock charts can tell you that a stock is about to become hot? What if you can read from the charts that the stock is about to jump very high in a short period of time? This is where volume in stock charts come in handy. Volume is the bars underneath the stock prices. It shows you how much stock is being bought or sold or change hands in a single day. One thing that investors cannot hide is their buying volume. It is required by law for trading volume to be shown for each day's transaction. At least for US stocks. But I guess all listed stocks around the world show volume today. 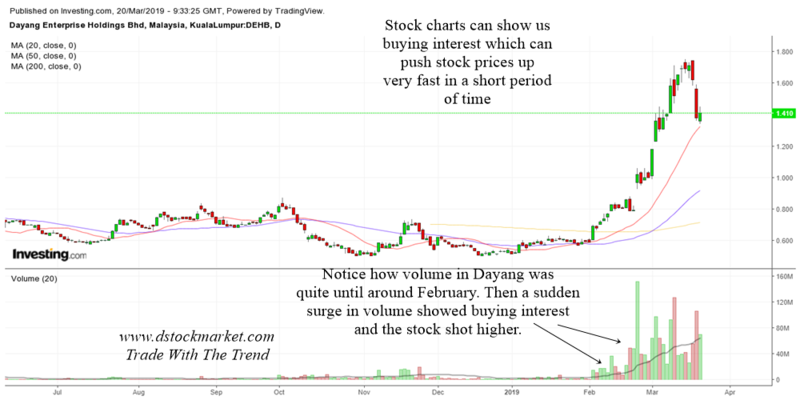 Take for example the stock chart of Dayang Enterprise which is a Malaysian company related to oil. Notice how the price shot up rapidly. Prior to the massive move up you will also notice that the volume was quite dry. Then all of a sudden, volume started to pick up. A huge surge in volume signal to observant traders that there is interest in the stock. Large investors will move in lots of money into a stock that they think will go higher. Anything that is good for the future bottom line of the company is reflected in a surge in prices at the present. That's because prices will go up weeks or months before something materializes. Investors put money into a company today when they expect good stuff in the company in the future. So if an investor thinks that a company will do well financially in a few months time, they will put in the money now and not after all the good things have happen. And when large investors move money in...they move in millions and perhaps hundreds of millions. This is where you see a surge in volume. And that is why Dayang had such an unusual volume. One of the secrets of stock picking is Unusual Volume Often Precedes Massive Price Moves. So the next time you look at a stock chart and you notice unusual buying activity in a stock, pay attention as you may come across a potential winner. Many things in life repeats itself. You have winter, spring, summer, autumn. Ok you may be staying in a tropical climate where it rains all year round and the weather is always hot. But even in these places you do have day and night isn't it? Day comes after night and night comes after day. The way God created this world, there are lots of repeating patterns. The stock market also has repetitive patterns. I told you earlier that stock charts can tell stories isn't it? I think you might think that your eyes are deceiving you or that I may have made a mistake by putting the ascending triangle as a continuation pattern and also a reversal pattern. Well....that is not a mistake. Some chart patterns can act as continuation patterns as well as reversal patterns. And ascending triangle is one of them. The chart above shows a daily ascending triangle at work. I told you earlier that ascending triangles can be a continuation pattern as well as a reversal pattern. In this case, the ascending triangle acted as a bullish reversal pattern. Prior to the appearance of this chart pattern, the stock was declining. Notice how it was trading below the 20 MA (red line). 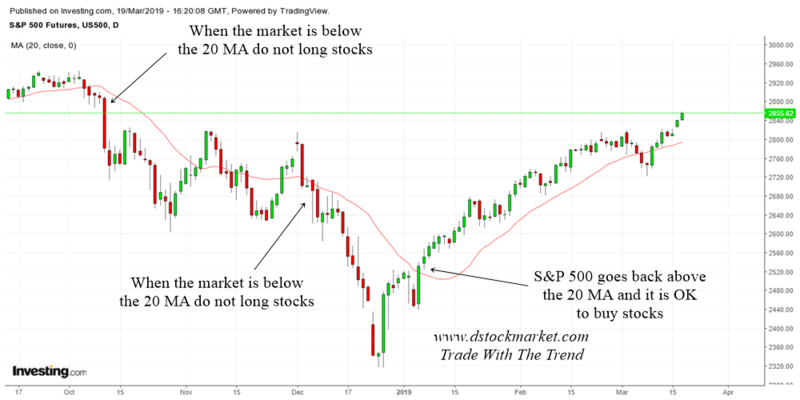 Remember earlier how I showed you how the 20 MA can act as a trend following tool to help us know when is an appropriate time to long stocks and when is not a good time to long stocks? Well, SKP Resources was trading below its 20 MA and that is why it was not good to buy this stock. The stock formed a higher low. When you connect the two lows you form the uptrend line for the ascending triangle chart pattern. You then draw a horizontal line and that completes the ascending triangle. The name ascending triangle implies to us that the triangle is going up. The stock made a higher low and it seems the stock does not want to go any lower. When the stock breaks out of the horizontal line, it is a buy signal. The pattern shows us that the stock has now ended its downward movement and is now beginning a new uptrend. Notice also how the stock trades back above the 20 MA. The moving average also gives us a signal that it is OK to long this stock. Let us now take a look at the ascending triangle chart pattern as a continuation pattern. 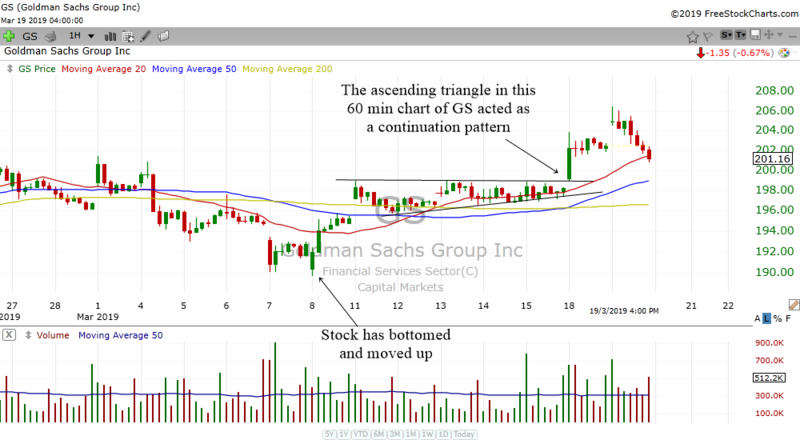 The chart above is the 60 min chart of Goldman Sachs. 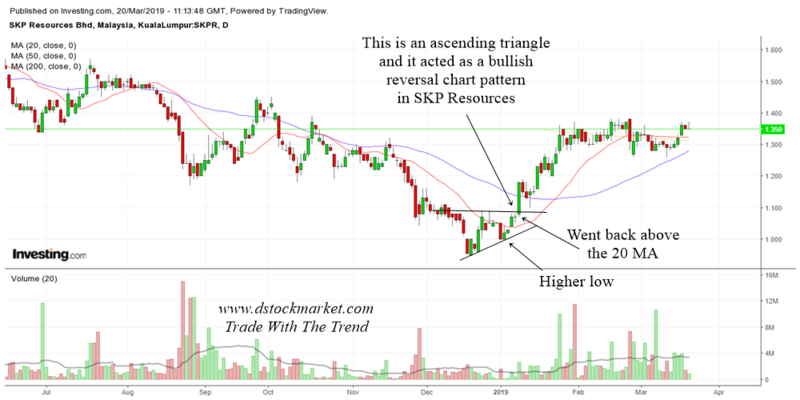 You will notice that the previous chart of SKP Resources is a daily chart while now I'm showing you a 60 min chart. That's something fantastic isn't it? Chart patterns can appear in any timeframe. In this case, GS had already bottomed and moved up. It then traded sideways but it formed a nice ascending triangle. The stock gap up above this chart pattern and it was telling us that the stock wants to continue moving higher. A simple chart pattern can tell you whether a stock wants to reverse or continue going higher. Truly indeed, stock charts through chart patterns can show us what is likely to happen in the future. That is why you should study stock charts and learn as much as you can about how to interpret stock charts. Chart patterns are formed by the activities of investors and traders. Every day there are thousands and even millions of people who buy and sell stocks in the market. Collectively their actions form chart patterns. When a stock falls, they tell us that market participants are fearful. When a stock rises, they tell us that market participants are hopeful. 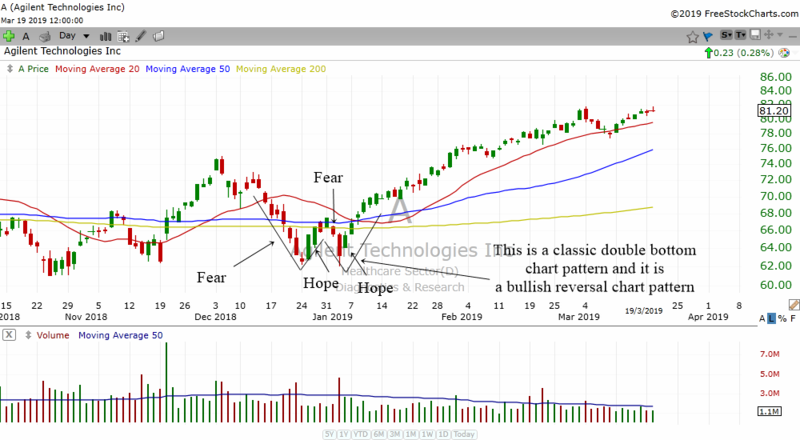 It is the oscillations between hope and fear and greed and fear that eventually form chart patterns that repeats itself again and again in the stock market. Because chart patterns can be so repetitive, the person or the trader that learns how to spot these chart patterns will have the ability to predict what might happen to a stock. The more he or she practices this skill of pattern recognition, the better he or she will be able to spot trading opportunities. Let me show you the chart pattern of a double bottom. What does a double bottom look like in the stock chart? Well it looks like a "W". When the stock falls, there is a lot of fear in that stock. Then as it rises a bit, there is a hint of hope. Then the stock falls again and fear once again comes in. But the fear does not last long as the stock rises again and once again hope triumphs over fear. When the stock continues to rise, all fear is forgotten and hope and then greed rules in the stock. Collectively, all the hope and fears and greed help to form movements and they result in the "W" shape. Throughout the history of the stock market, many market bottoms and stock bottoms have resulted in a "W" shape. And many new bull markets and bullish moves started with a "W" shape in the price of the stock. That is why the double bottom is a very reliable bullish reversal chart pattern. Are you convinced now about the usefulness of stock charts? Some may dismiss the usefulness of using a stock chart. But one should not throw away charts because they can often warn us about the dangers in the stock market. A very useful technical analysis tool is the trend line. Another very useful technical indicator is the 50 day moving average as well as the 200 day moving average. Well, trend lines and moving averages help us to follow the trend. When a market breaks below a trend line, it tells us that the market is getting weak. The uptrend is in danger. When the market breaks below the 50 day moving average, it also tells us that the trend is getting into trouble. Take a look at the chart of the S&P 500 above. 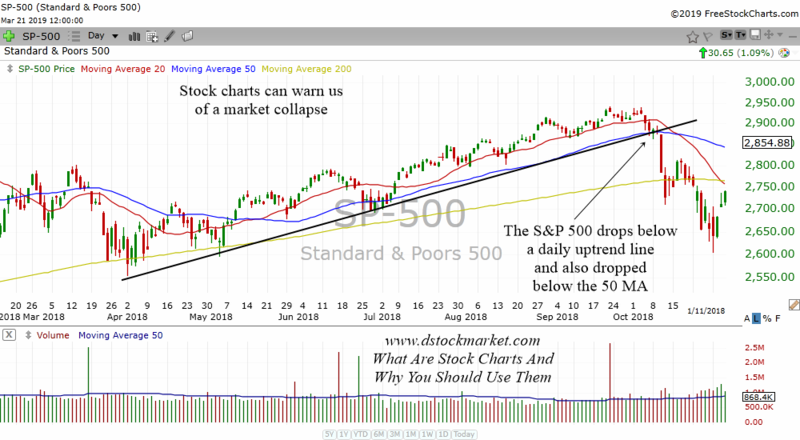 Around October 2018, the S&P 500 index dropped below an uptrend line and the 50 day moving average. This told traders and investors that the market is in trouble. Eventually it also drop below the 200 day moving average. And this signaled more weakness in the stock market. See the usefulness of using a stock chart? If a stock chart can warn us of weaknesses in the market, it can also be used to warn us of weaknesses in our stock. 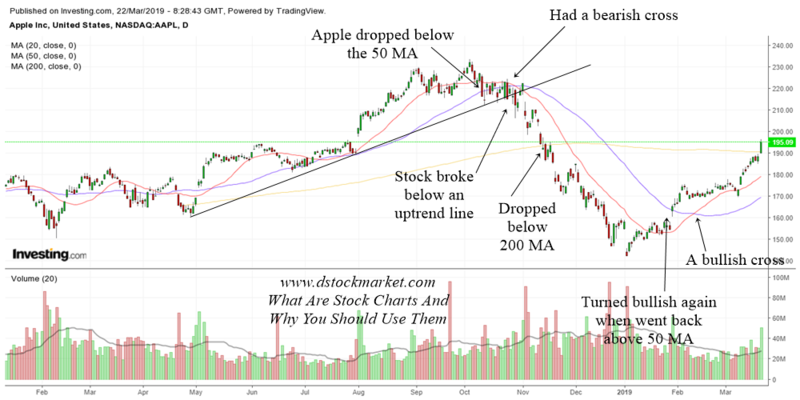 Yes...if you own individual stock investments like Apple or Google or Facebook, you can learn some technical analysis and save yourself a lot of losses. Apple is a very wonderful stock. But despite its rock star status, the stock has its own share of ups and down. When it collapses the losses can be huge. The recent sell off in October 2018 to January 2019 saw the stock collapsed from a high of around $230 to a low of around $142. That can be a terrifying ride down. A scary rollercoaster. But before it collapsed, Apple gave many warning signs. All these are bearish signs for a stock. If you had known about the above, you would be able to foresee the weakness in Apple. An investor might have been able to save himself from this devastating loss. Using charts to analyze the markets is often referred to as technical analysis. On the other hand, looking at the balance sheets and ratios of a company is often referred to as fundamental analysis. There are lots of debate out there but in our opinion it does not matter as long as the method takes you to your destination which is making money in the stock market. It's just like someone debating whether a Boeing Aeroplane or Airbus is better. In the grand scheme of things, it does not matter! Both type of airplanes have been successfully used to transport people all over the world. As long as the method does the job, then it is good. Having said that, there are lots of professionals that combine both type of analysis to make money in the markets. Even if they do not master them, they at least have a passing knowledge of the other discipline. Here in Dstockmarket, my emphasis is on technical analysis because we know that price and volume tells us all we need to know about the actions of market participants. And from there we can plan our actions. There are many more out there but these are the popular ones. 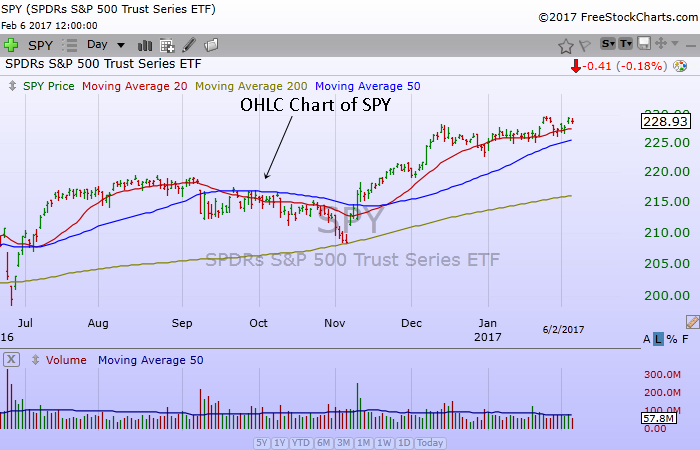 Below is the chart of SPY using the OHLC type of chart. You can see that it is in a different color as well. It does not matter as long as it helps the trader to analyze stocks. All of these are just a matter of preference. In my opinion, I believe the best type of chart is the Japanese Candlestick Chart. Many indicators in the stock chart are Western Indicators. By using the Japanese Candlestick Chart with Western Indicators, you are combining the best of both worlds. You are combining the East and West to form a very good analytical tool. This is what a Japanese Candlestick chart looks like. It is the same type of chart I showed you in the many charts above except the OHLC chart. Notice how they have solid greens and solid red and some have tails and wicks at the tops and bottoms of each bar. This is a daily chart, therefore, each bar represent one trading day. If the bar is green, that means the market went up. If it is red, it means the market went down. Large green candles represent furious buying moments. While large red bars tells us that there was extreme selling. There are entire books written on the subject of Japanese Candlesticks alone. Yes, one can use them in conjunction with Western indicators. 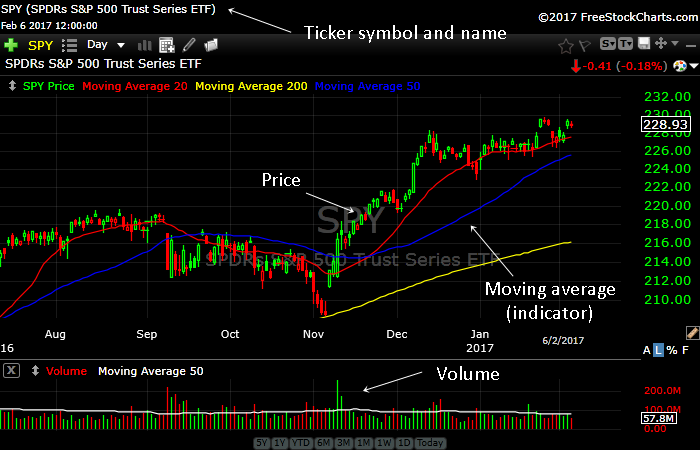 The chart of SPY above shows how a short term bottom can be spotted. The SPY was quite oversold in the stochastics indicator. SPY also dropped to an area of price support as well as the 200 MA support. There were several red candles and then a green bullish candle appeared at the area. This told us that for many days the bears were in control but when SPY reach the support area, the bulls came back to win the day. This hinted of a bullish reversal. 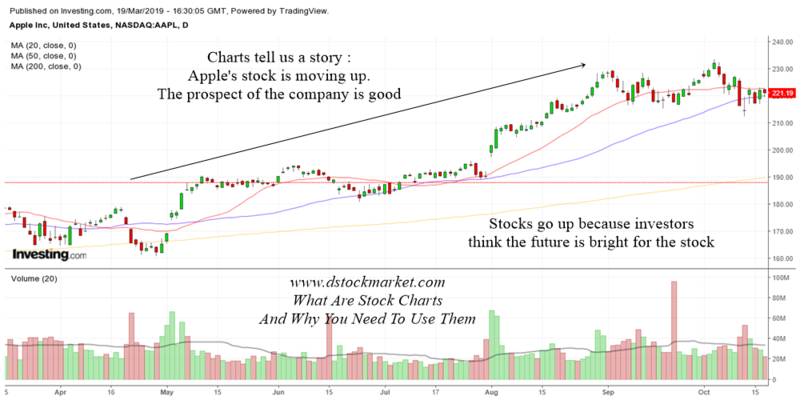 Now that you are probably interested in using stock charts, I think the question that you might have is where do I find Reliable and Up To Date stock charts that you can use? We have moved a long way since the beginnings of the internet. Today, many chart providers offer investors and traders FREE stock charts. You do no need to pay a single cents or penny to use their services. Many are powered by Advertisements and many offer you free charting services in the hope that you will upgrade it to a pay service where you get more tools. Do note that for popular stocks and index ETF, stock chart providers often give real time quotes. But for less popular stocks, they usually have a delay of 15 minutes. That is alright if you are not day trading. If you really want an instantaneous quote then they will charge you a monthly fee for that data. Freestockcharts.com is my favorite. It's name tell what it is. You get free stock charts on their site. I use their paid version some extra bells and whistles. But you can try the free version to see how it works. I recommend that you download their desktop app so you don't need to use a browser to view the charts. I like Freestockcharts.com because this is the only chart provider that I know of that allows me to go through lots of charts very fast. I can call up a list of stocks like the S&P 500 and then I can start with the first stock on the list and press the down button and the next chart will load very fast. Other stock chart providers that I know of needs you to input the symbol of the stock one by one. Sure you can have a list and view 10 stock charts on a page but then you would need to use your mouse to scroll down the page to see all the stock charts. Sometimes I use the scanning in Freestockcharts.com but many times I do not. I like to go through the S&P 500 stocks one by one. I also like to go through the Nasdaq 100 stocks, then the S&P 100 stocks and the Dow 30. There are so many functions of freestockcharts that one can view compared to other stock chart providers. I guess each one has its pros and cons but for me freestockcharts.com is the best for my purposes.